The classical terraces of Carlton Place (1802-1818) have a unique setting on the south bank of the River Clyde opposite the City Centre of Glasgow. Upstream from the limit of ship navigation, this is the only section of the Clyde where the street blocks of the surrounding area form frontages along its banks creating an elegant urban set piece. Carlton Place was originally built as part of a larger but unrealised development of town houses and was the first attempt in the city to organise a whole street into a symmetrical architectural composition. Although Carlton Place may originally have been a desirable residential location, industrial growth during the later half of the 19th century made living conditions in the city centre less attractive and the buildings were gradually taken over by businesses as residents moved to newer residential areas further south or to the west of the City Centre. By the latter half of the 20th century, few residential uses remained and the condition of the buildings began to give cause for concern. Also, the surrounding area was deteriorating with numerous vacant properties and gap sites creating an air of decline. The challenge was therefore to restore Carlton Place to its former elegance, to bring about the regeneration of this important stretch of riverside and to restore life to the surrounding area. Glasgow District Council prepared a detailed design brief for the restoration of the terraces and a design guide for the development of adjacent sites on Bridge Street and Oxford Street. Restoration work commenced in the early 1990s with the financial support of the City Council, Historic Scotland, Glasgow Development Agency and private landowners totalling £5M. The restoration and repair work has been carried out to very high standards to fulfil the design brief’s desire to recreate a ‘Georgian Precinct’. This has involved external repair of the buildings to their original form including stone restoration, window replacement in timber, replacement of chimneys, doors , steps and entrance details and railings. Carlton Place itself has been improved with new carriageway setts, Caithness slab pavements, new lighting and street name-plates. The project won a Civic Trust Award in 1995. The Council has also renovated the pedestrian suspension bridge leading across to the City Centre. Since the completion of the work, a number of businesses have relocated to Carlton Place and the terrace is developing a broad range of mixed uses including a hospice. Significantly, other developments in the Bridge Street and Oxford Street area are being completed including new residential properties with retail ground floor uses respecting the grain and street pattern of the area. This suggests that the Carlton Place area has started to develop the critical mass and developer confidence necessary for continuing development and a stable future. 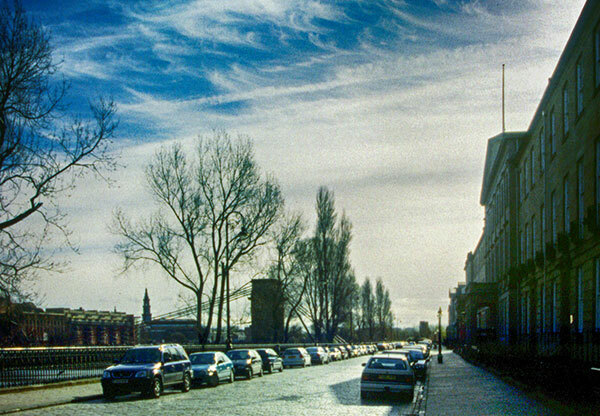 A number of lessons emerge from the Carlton Place project: riversides are inherently attractive locations, historic buildings are assets whose restoration can be the fulcrum around which area regeneration can turn and environmental improvement coupled with heritage can help to provide a sense of place and focus for new investment. There is also a lesson in the Carlton Place buildings themselves: almost 200 years old, they are still able to accommodate valuable city functions as well as contributing to the visual richness of the riverside environment.